Synthetic peptide conjugated to KLH derived from within residues 800 - 900 of Mouse Tex14. 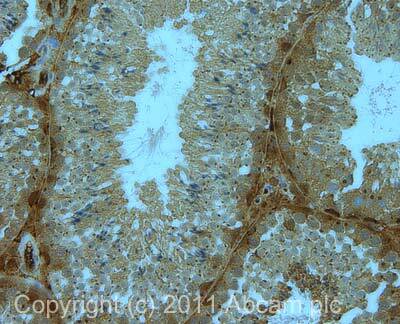 In IHC, this antibody gave a positive signal in a mouse testis FFPE section. Our Abpromise guarantee covers the use of ab42414 in the following tested applications. Testis-expressed gene 14 (TEX14) is a novel protein that localizes to germ cell intercellular bridges. In the absence of TEX14, intercellular bridges are not observed. Spermatogenesis in Tex14–/– mice progresses through the transit amplification of diploid spermatogonia and the expression of early meiotic markers but halts before the completion of the first meiotic division. 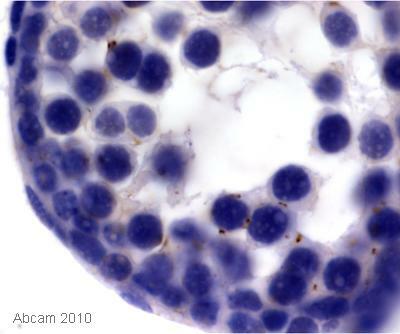 IHC image of Tex14 staining in mouse normal testis formalin fixed paraffin embedded tissue section, performed on a Leica BondTM system using the standard protocol F. The section was pre-treated using heat mediated antigen retrieval with sodium citrate buffer (pH6, epitope retrieval solution 1) for 20 mins. The section was then incubated with ab42414, 5µg/ml, for 15 mins at room temperature and detected using an HRP conjugated compact polymer system. DAB was used as the chromogen. The section was then counterstained with haematoxylin and mounted with DPX. ab42414 has not yet been referenced specifically in any publications. Publishing research using ab42414? Please let us know so that we can cite the reference in this datasheet. To the technical assistence of Abcam. I have been looking at an antibody against TEX14 i human, and I can see that you have two TEX14 antibodies: ab42414 and ab41733. In the datasheets of both of the antibodies it is stated that they react with mouse tissues. I would as stated like to use human tissues. Do you have any information if one or bothof these antibodies would cross-react with human tissues? Thank you in advance. Thank you for contacting Abcam. Neither ab42414 or ab41733 have been tested on human samples and based on sequence homology between the mouse immunogen sequence and the human sequence, I do not think that they would react. 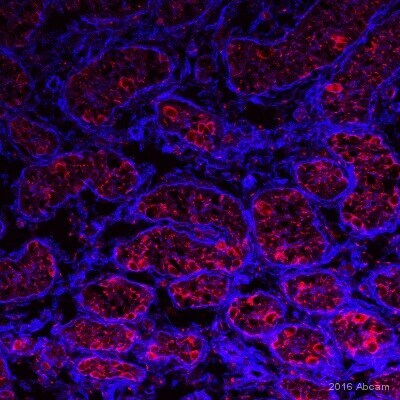 However, ab74835 will react with human tissue, depending on the application that you want to use it in, you may be eligible for a testing discount, please see the link below for more details: https://www.abcam.com/index.html?pageconfig=resource&rid=11998&viapagetrap=collaborationdiscount Please let me know if there is anything else I can help you with.